Well, I’m still plugging away on cleaning out the drawers. Last Sunday I started with the goal to clean out four drawers, (since social engagements kept me out too late to come home and start cleaning). But two drawers in and I was completely overwhelmed. My brother told me that it’s best to do it no more than for short bursts–15 minutes at a time. And it’s true. However, not only did I clean out those drawers I found things and properly righted them. Often times things aren’t finished. How many times have we started projects, taken things out and left the remnants on the dresser, the table, the floor? Or crammed them into the wrong drawer because someone was coming over? 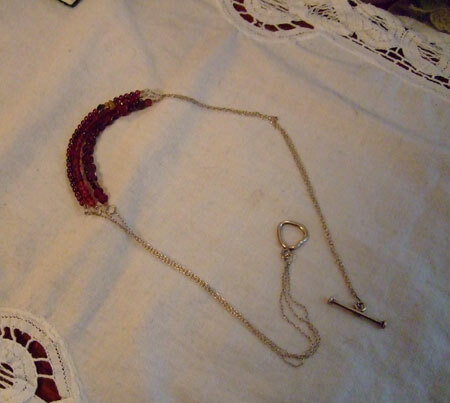 It is damningly too easy to put a broken necklace in a drawer and forget about it. Which is what I did. But that Sunday, I had Eric fix it. 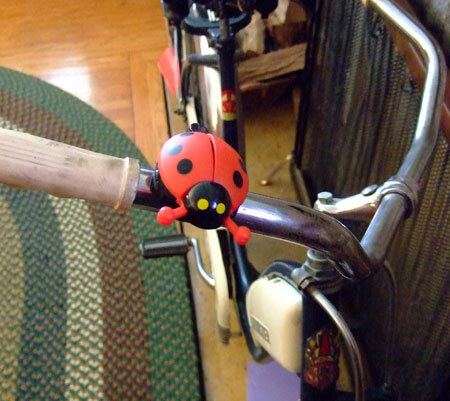 And I found in one of the drawers I was cleaning out this darling lady bug bell for my bicycle. That I bought 2 years ago. But that Sunday I finally put it on my bike. I know. I know. These things so so insignificant. So small. But with every drawer, I feel that I am helping make room in my world and my goals and to help make life more livable on a day to day basis. After all, it is the little things in life that can bring you the most joy. My sweetie and I have two goals to do by the end of the year and one of them is buy a house. I don’t want the clutter to follow me to the new house. So getting through everything now is essential. Stay tuned for next week, which will all be about FILING! Whoo hoo! What an adorable little bike bell! And good for you, you’re conquering the clutter! Ah…look how adorable you are! It is so fun when you get your first good look at a blog buddy. 😉 Actually, I think we kinda look alike. Hey, I just inadvertently said I’m adorable. Well, that’s conceited. Too much caffeine today…sorry. That scarf really is beautiful! And isn’t it just even more beautiful knowing it was made with love! That’s the best! I ADORE handmade gifts! So, I tried to email you and for some reason it kept bouncing back. hmm? So, I’m gonna post my little email below. Having just bought a house and being on a seriously tight budget for awhile I’ve been rediscovering things I already had, fixing them, polishing them up, etc. And I truly never realized not only how much we already have but how little we need. I use to be seriously bad about the instant gratification of purchasing “stuff.” I’m finding it so much more rewarding (seriously!) to re-work and re-purpose what we already have and donating what we don’t need. It feels so cleansing, like a fresh beginning!